Day 28- Sunday. 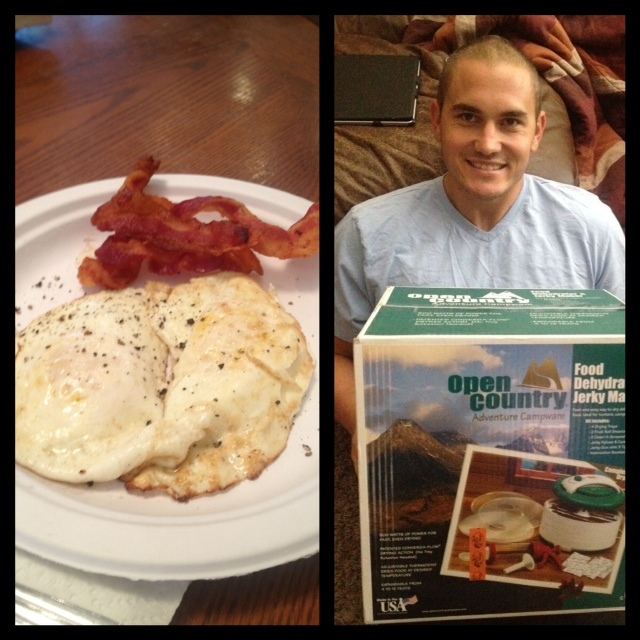 Today we woke up and had an egg for breakfast. I got a little crazy and had mine fried instead of the usual scrambled. My parents also gave us an extra de-hydrater they had laying around (why they had two, I will never know) and Matt was pretty excited. He spent the morning naming all of the foods he wants to dehydrate once we get home. After breakfast we went shopping and I bought a pair of heels for my friend Kasey's wedding this upcoming weekend. Then for lunch we snacked on a Brian'd bowl. 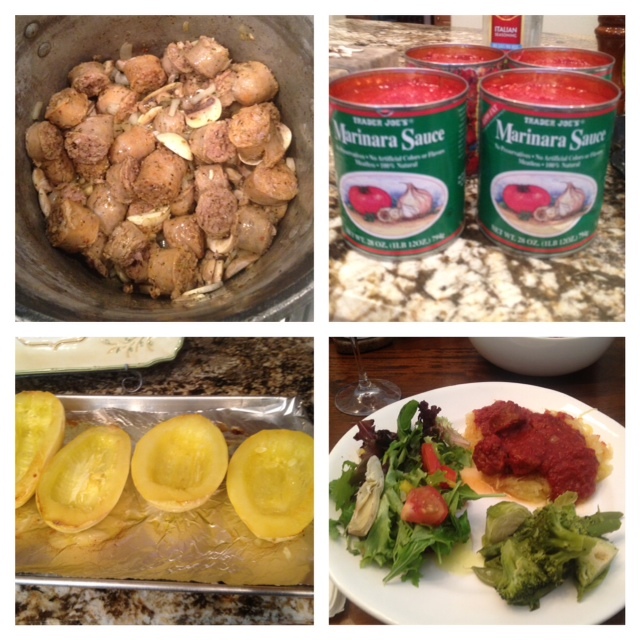 For dinner my grandparents came over and my Italian mother made some very delicious sausage-mushroom marinara sauce. The family had pasta while Matt and I stuck a couple of Spaghetti Squashes in the oven for about 45 min. Dinner ended up being delicious- and I even survived watching everyone eat some garlic bread which is usually one of my favorite parts of a pasta dinner. By the way if you haven't noticed I learned how to collage photos. Let me just say this little trick makes my life 100x easier! We spent the rest of the night driving back to Pasadena, and got home around 12 AM. The drive was super tiring, and usually after a normal pasta dinner I am asleep within 30 min of sitting in the car. I was surprised to find that I was able to stay up the WHOLE trip back to Pasadena. If you know me, this will come as a shock. I think it has to do with the fact that spaghetti squash is much lighter than regular pasta. 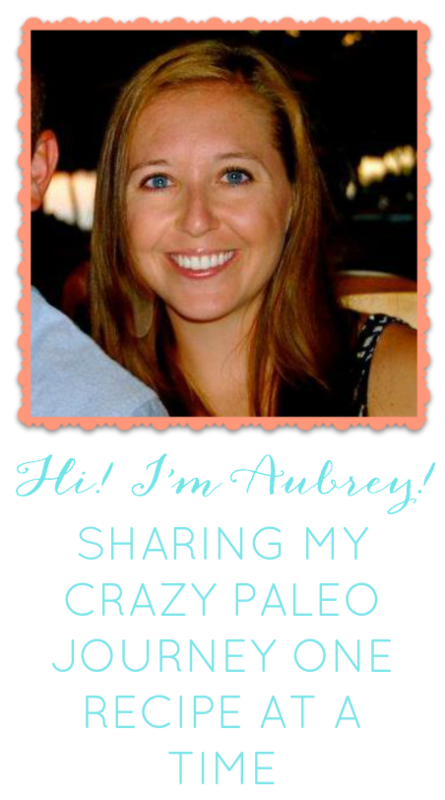 Another point for Paleo. This recipe is actually pretty easy but kind of messy. Here is what you do in some steps. Begin by preheating your oven to 350. 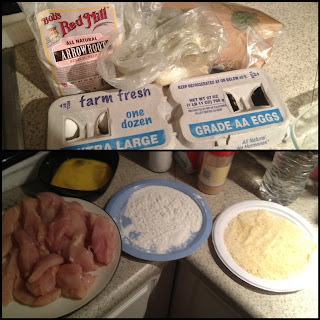 Step 1: Set up 4 'stations'- the chicken cut into tenders, a bowl with the 3 eggs whisked together, a plate with the arrowroot flour and a plate with half the almond flour. In the almond flour I added some garlic salt and some pepper to taste. Step 2: Get a pan and melt some coconut oil on medium heat. Then TURN off the heat and let the oil sit. 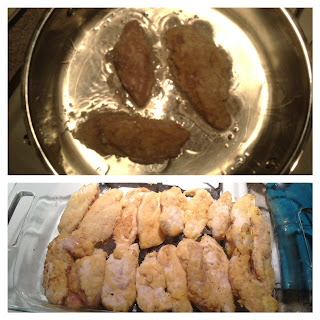 I did not do this at first and tried to brown the tenders in sets of 3 or 4- but the leftover almond flour burned and it became a mess. Step 3: Then dip a tender in egg, then the arrowroot, then the egg, then the almond flour and set it in the pan. Continue this until the pan is full. Then turn on the heat and brown the chicken on both sides (about a minute each side). Once a tender is browned place it in an oven safe dish. Step 4: Repeat. I also switched up the dipping a bit just to experiment. I dipped some in the egg, then arrowroot, then almond and some in the arrowroot, then egg, then almond. 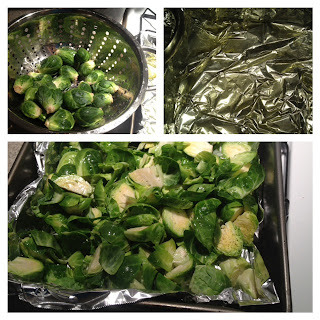 Once all my tenders were done I stuck them in the oven, cleaned my counter and cut the stems off the brussel sprouts. Then I quartered them, put them in an oven safe dish, mixed them in the oil and added salt, pepper and a little garlic powder. 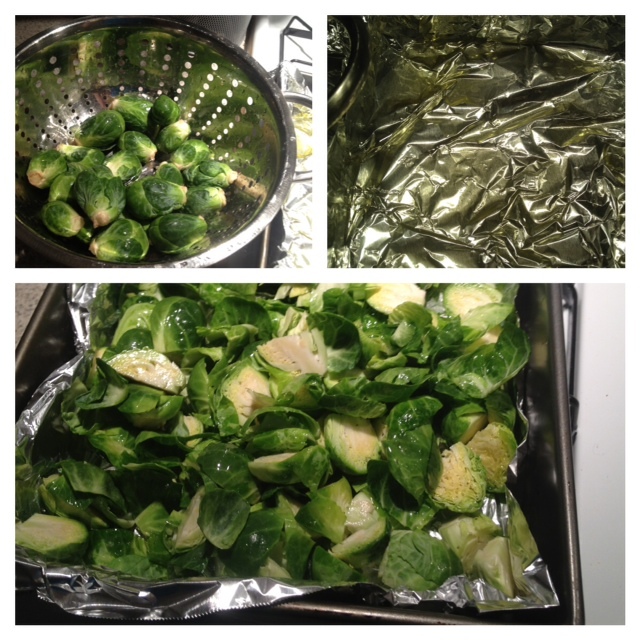 This took around 10-15 min, then I added the brussel sprouts to the oven. 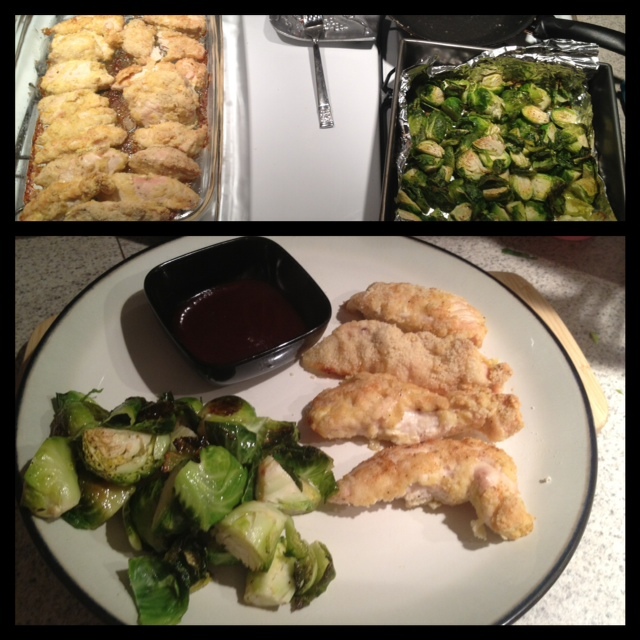 I cooked the chicken for about 30-45 minutes and the sprouts cooked for about 15-20 minutes. I know, I know, I should have watched the clock better. Just wait until the sprouts brown, and until you can cut a chicken tender in half and the juiced run clear and it is white inside. 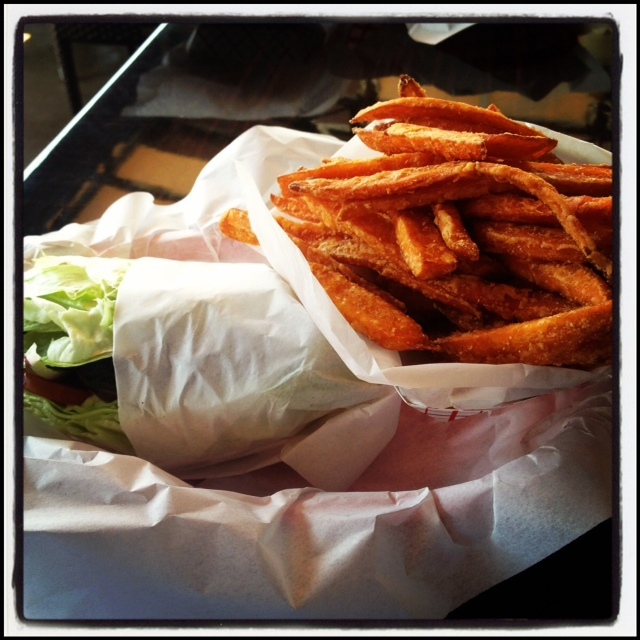 We dipped them in BBQ sauce and they were awesome!! Just what we needed after a two-a-day. Day 30- Monday. WOW. Our 30th day. Our last day of the challenge and coincidentally my last day at work. I have a lot to say but I am so exhausted I will write a nice big post tomorrow. Today was very easy. I was running late. So all I had for breakfast was a handful of nuts. 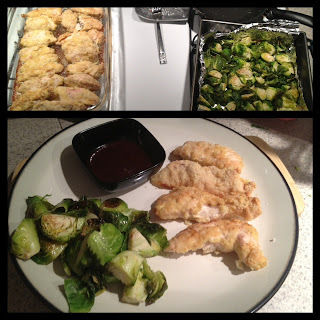 Then for lunch I had leftover chicken and brussel sprouts- which were just as delicious the next day. Then for dinner we met my dad, my uncle and my cousin for dinner. 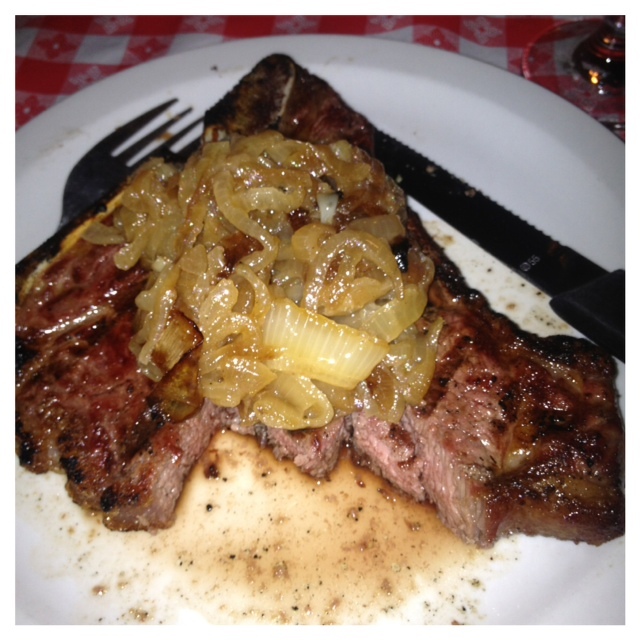 We went to a steakhouse and I got a 15 ouncer that was AWESOME. I had a salad with no dressing (boring) and some onions with my steak. 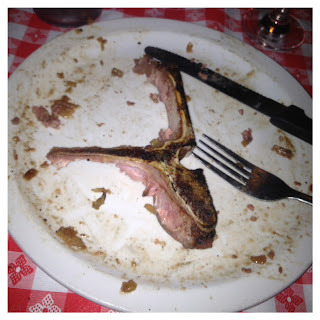 I ate every bit of that steak because I was starving. I also had a small glass of wine to celebrate my last day at work.